Add a touch of radiance to skin with the Marshmallow Body Oil from MOR. Designed to provide a delicate fragrance to skin whilst delivering intense moisture. The oil is easy to apply, with a spray function offering a delicate mist. The formula is infused with Grape Seed, Avocado and Sunflower Oil, which work to soften the skin, leaving it feeling truly nourished. The feminine Marshmallow scent is collectively orchestrated with Jasmine Flower and Vanilla Musk, whilst White Carnation and Cotton Candy form a sweet perfume. 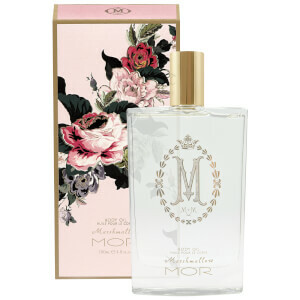 I've been looking EVERYWHERE for the Mor Marshmallow products and I was so happy to find that LookFantastic has them. This is my favorite rose-scented fragrance...it's so soft and sweet, but not in a sickly sweet/teen-fragrance way. It's a little musky, and the vanilla adds such a nice touch. The body oil leaves a lovely scent, not too strong. The oil itself absorbs pretty quickly, leaves no oily residue or greasy feeling behind. A good alternative to the perfume if you wanna save a bit.